Former Arkansas Gov. Mike Huckabee thanked President Obama today at the Conservative Political Action Conference in Washington, D.C., for his birth control positions, according to CBS News. Huckabee said that without Obama, there would never have been a firestorm around the hot-button issue to which he believes the Republican presidential candidates have failed to pay attention. "You have done more than any person in the entire GOP field — any candidate — has done to bring this party to unity and energize this party as a result of your attack on religious liberty," said Huckabee. "In many ways, thanks to President Obama, we are all Catholics now." Shortly after Huckabee's speech, the White House announced that the plan would be tweaked so that in cases where nonprofit religious organizations have objections, insurance companies would be required to reach out to employees and offer the coverage directly. But the plan will still provide contraceptive coverage for women. The ruling, made in January, requires all employers to provide contraception in their insurance coverage. Catholic-run institutions in particular are opposed to the decision because the religion officially bans the use of contraception. 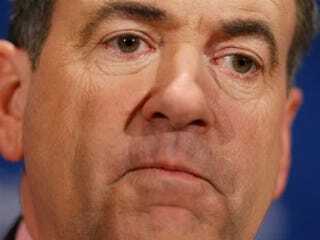 Huckabee, who has become a television pundit over the last few years on Fox News, said that the 2012 elections have been focused strictly on the economy, but this birth control issue shows that morality will play a major role. "One of the things the actions of the president … has shown us is that morality matters even more than money does," he said. "Where there is a nation that has lost its morals … we will certainly give up what's in our pockets." Huckabee is once again trying to paint birth control use and reproductive rights as part of a Democratic ideal that is ruining our country, when in reality, more than a quarter of women who use birth control in this country identify as Protestant or Catholic, according to the Guttmacher Institute. Public opinion polls on this issue also showed overwhelming support for the president's plan. How anyone's religious liberty is being harmed in all of this is unclear. In the end, it's all political posturing in hopes of getting President Obama out in November. But why battle the president on issues for which he clearly has public support? The Republicans need to find a clear strategy instead of focusing on what they believe to be the million injuries that Obama has inflicted upon this country.